4mm and 6mm shank carbide toolholder with 60 degree engraving carbide inserts. •Depth of per cutting Ap up to 0.8mm for carbon steel, 0.5mm for stainless steel. 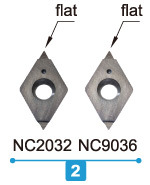 •W060 series carbide insert is for fine and thin engraving, used on engraving machine. Wmin. 0.1~0.3 all are interchangeable on same holder. •Carbide shank holders designed for shrink-fit holder, engraving machines, high speed cutting. K20F grade, for steel from 30~50 HRC, carbon steel, alloy steel & cast iron. K20F grade, ALDURA coating reduces heat and tool wear, for steel with heat treatment up to 56 HRC. K20F grade, for non-ferrous, ex : aluminum, brass copper, titanium, plastic & acrylic. Very sharp edge for shallow engraving. K20F grade, for non-ferrous metals, ex : aluminum, brass copper, titanium, plastic & acrylic. Very sharp edge, producing excellent surface finish.